Why do listed buildings require special insurance? When it comes to providing cover, most mainstream insurance policies are designed around a broad, “one size fits all” approach which is designed to provide cover for buildings of ‘standard’ construction, i.e. newer buildings with brick cavity walls, concrete floors and tiled roofs. From the outset this means that such insurance is unsuitable for listed buildings as few fall into this category. Your responsibility to conserve the building: In the event of damage to your property, your conservation officer may specify that all repairs or rebuilding must be carried out to their exact specifications using the appropriate traditional methods and materials. Non-standard construction: Repairing a building which is of timber-framing, cob, stone, or traditional brickwork requires specialist skills which are often more costly and time-consuming. Your insurance policy must be designed to cover the use of such skills should the property need to be repaired or reinstated. Your responsibility to rebuild or reinstate: In the case of partial damage, a non-listed property might be written off and simply rebuilt if this is the cheaper option.With listed buildings it is more often the case that the property will have to be reinstated as per the instructions of the conservation officer which will be technically challenging and so more costly. Unauthorised work: If a previous owner made alterations to the building without consent, the local planning authority may require you to reverse those alterations at your own cost. When you are buying a listed building you always should ensure that your insurance policy will cover you should you later discover any unauthorised alterations and that you make suitable searches in order to make sure that all alterations have the correct consent. Undertaking work: You should choose an insurer that will cover your building while work is carried out. Re-building cost: Figures given for properties of ‘standard’ construction don’t apply to listed buildings and you will need to get specialist advice in order to determine the correct cost of rebuilding your home. Without an accurate rebuild cost you could be inadequately insured. Alternative accommodation: Repairing or rebuilding a listed building tends to take longer due to the consents that need to be put in place, the time needed to source (and possibly wait for) appropriately skilled craftsmen and because specialist trades tend to be more time consuming. On top of all the other stress, you do not want to be worried about the cost of extended alternative accommodation. Curtilage listed: Curtilage is the area of land around a listed building which is ancillary to it (or was on the date of listing). 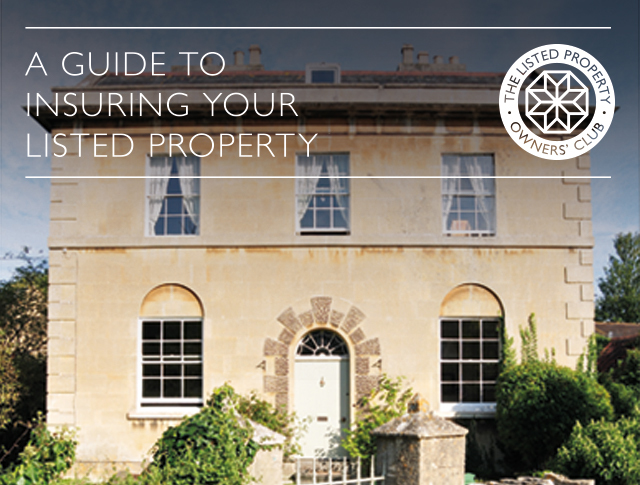 If your property is situated within the curtilage of, or attached to a listed building, it may also be listed. If this is the case, you will require listed building insurance even if your home does not have a listing of its own. Expert staff: The staff you deal with should have a proper understanding of listed buildings and the requirements and responsibilities of owners. You can speak to the insurance team for a quote or for assistance in arranging for a professionally qualified surveyor to advise on a suitable rebuild figure. To speak with a specialist call the Club today on 01795 844939 and we will pass you onto the insurance team.